Democracy isn’t just for grown-ups. After all, kids are citizens, too! 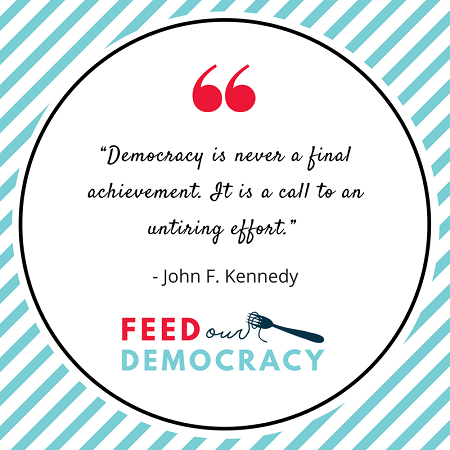 Feed Our Democracy and KidzVuz have joined forces to put together this Kids Are Activists Too! Toolkit. Here, you’ll find resources to get your kids started along the path of actively participating in the democratic process. Kids can’t vote…yet, But kid activists have the ability to be heard, to influence others, and to make a difference. 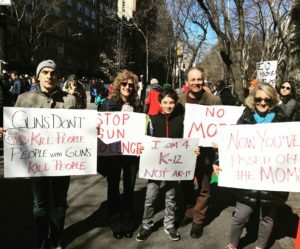 This year alone, thousands of kids showed up for the March For Our Lives and The National School Walkout – both initiatives, incidentally, organized by kids. Being activists doesn’t mean your kids have to be political; kids can be active in helping those less fortunate, helping out after national disasters, or raising awareness about a cause that matters to them like the environment, literacy, or homelessness. Getting your kids used to being active in political and social movements now is a great way to make sure they group up to be productive, compassionate adults. It’s never too early to start encouraging and developing empathy in your kids. Here are some simple ideas for even the youngest kids. Home Visits. Do you have any older neighbors who might enjoy a visit with a smiley, happy child? Visiting elderly or lonely neighbors to show off a new Halloween costume, sing a song, or just say hello is an easy way to teach your kids that they are part of a broader community. Greeting Cards. Is your kid a bit too shy to visit with neighbors? They can make greeting cards to send to Military personnel, wounded veterans, homebound elderly, hospitalized kids, and more. Keep the messages uplifting and devoid of any personal information. Your kids can make a difference. Simple Acts of Kindness. Have your kids give sanitation workers or their mail carrier cold drinks or popsicles on a hot day. Pick up litter in your local park. Donate. Encourage your kids to give away toys and books once they’re done with them. 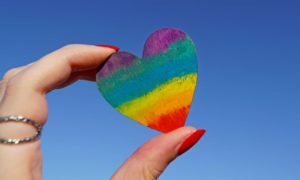 This wonderful post is about teaching children about real giving and its lessons can be applied to children of any age. Make treats and deliver them to your local police or fire station. Read books about compassion, understanding, and more. See a few of our favorites in the Resources section below. Often, it makes sense to join organizations that already exist. They’ve got the experience, and they’ve got it down. Here are some existing organizations geared towards getting kids involved. Many organizations allow kids 13 and up to participate in organized volunteer activities. Check with your local soup kitchen or food bank. Others will only allow kids if there is an adult along with them. Check Volunteer Match and Red Cross Youth for lots of ideas for kids to volunteer. Town Halls. Is there something going on in your neighborhood that will affect your kids? Have them attend a Town Hall where local citizens are invited to speak and ask questions. KidzVuz is all about letting kids express their opinions and have their say. Show your kids that they’re entitled to be heard. Help the homeless. Bring your children with you to cook or serve meals at a homeless shelter. Kid activists don’t have to be political – just involved. March. There are no age restrictions when it comes to the age-old democratic tradition of taking to the streets for a cause. Encourage your kids to get their friends marching, too. Lots of our Feed Our Democracy Tool Kits will work – or are easy to adapt – for anyone from age 8 and up. Check out these toolkits with your kids to get ideas for how they can host their own events. Even the littlest kids can participate in making recycled crafts, while older kids can plan their own events. 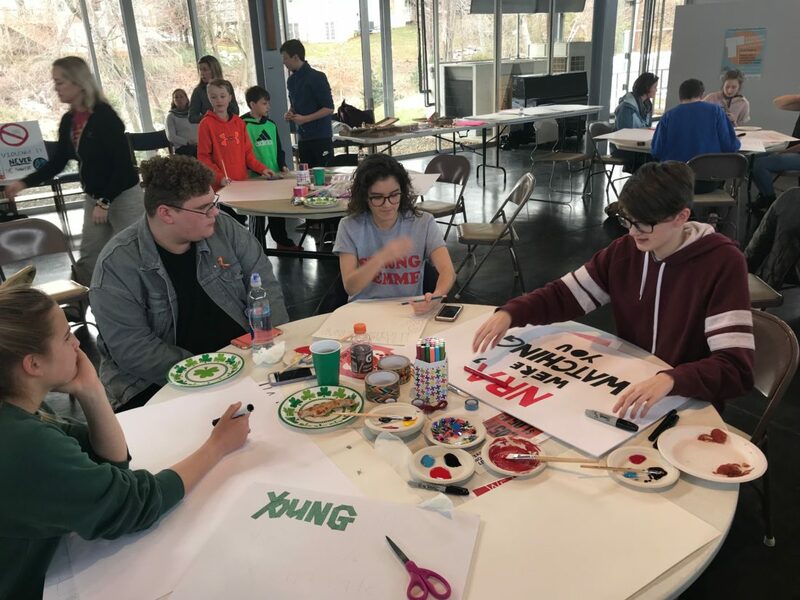 Pizza and Posterboards Party – Is there a march coming up in your neighborhood? This toolkit gives them the tools they need to get ready for the big day with their friends of all ages. 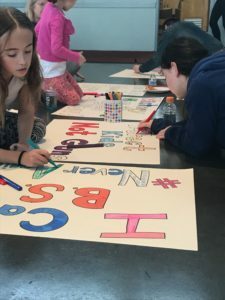 Postcard Writing Party – Maybe kids can’t vote, but lawmakers still represent them, and they have a right to be heard. 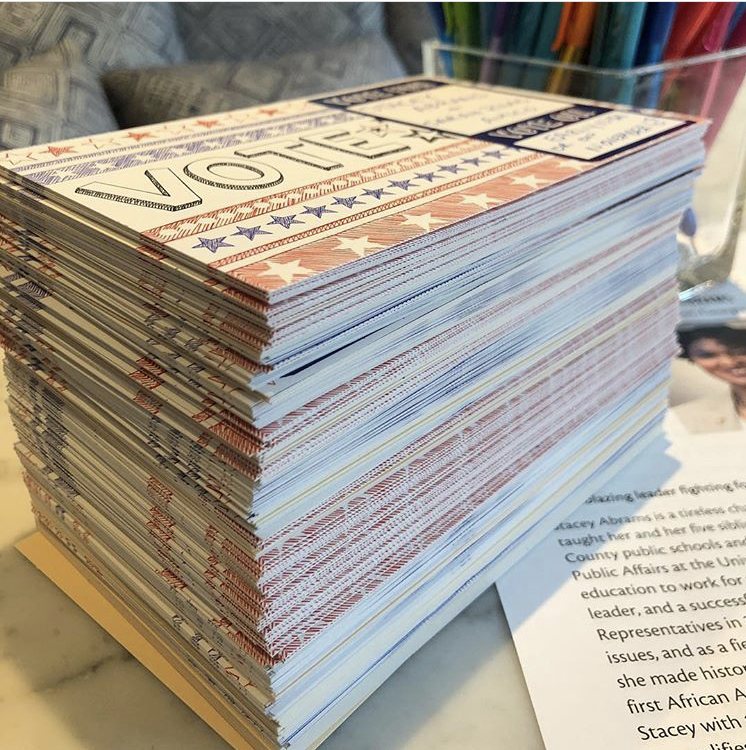 If there’s an issue that matters to your kids, have them host a Postcard Writing party to let their elected officials know what’s on their minds. Kid activists grow up to be voters, and officials know that. DoSomething.Org mobilizes young people in every US area code and in 131 countries! 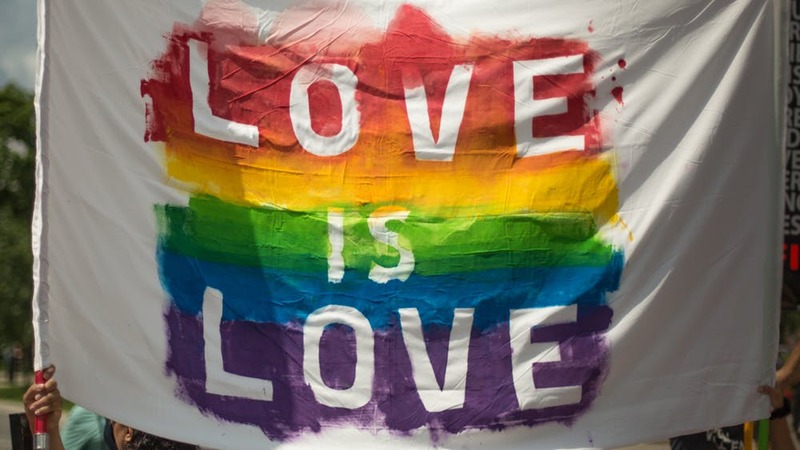 Their volunteer, social change, and civic action campaigns are all designed to make a real-world impact on causes important to young people, including the environment, homelessness, and more. Most of DoSomething’s initiatives aren’t particularly political or controversial (I mean, who doesn’t want to clean up 3.7 million cigarette butts? ), so they’re a great place to start looking for a way for your teen to, well, Do Something they can feel good about. Youth Service America (YSA), Powered by YSA, BE FEARLESS BE KIND, is a philanthropic initiative of Hasbro, Inc. Designed to inspire and empower kids to have the compassion, empathy and courage to stand up for others and be inclusive throughout their lives, the initiative asks kids to take a pledge to be good to others. For everyone who takes the pledge through Hasbro will donate a toy or game to Toys for Tots for up to 50,000 children in need during the holiday season. This is a simple way to get younger kids started on joining organized efforts to improve the world we live in, and to make compassion a part of their daily lives. Youth Volunteer Corps (YVC) is a network of affiliated organizations across the U.S. and Canada engaging youth ages 11-18 in team-based, structured, diverse, flexible service-learning opportunities. Several survivors of the Parkland shooting started this movement to elect leaders who will stand up to gun violence and hold them to task. While geared towards older kids and teens – the site encourages kids of voting age to register themselves and others – there’s lots of practical advice on the site how any kid get involved at a local level and be heard. Want to raise “woke” kids, but not ready to commit to hosting an event or joining an existing organization? Check out this list of 40 picture Books for Young Activists from All the Wonders website to inspire you and your kids. Older kids might find inspiration from these 7 Inspiring Reads for Kids who want to Change the World, from Brightly. Preschool to Third Graders will enjoy the What Does It Mean series by Rana Diori. Remember, involved kids grow up to be involved adults. And your kid activists don’t have to do a lot to make a big difference. So you want to Save the Environment but don’t know where to start? Lately, the reports on the state of our environment have not been good. The recently released National Climate Assessment painted a bleak picture, coming to the conclusion that Global warming is affecting the United States more severely than ever before, and that the risks of future coastal flooding, crop failure, forest fires, droughts and more— could cost the United States billions and deeply effect our health and well being. But don’t despair! You can make a difference by hosting a Save the Environment party with your friends and neighbors to help raise funds or awareness (or both) around the environment. Here are downloadable materials and specific suggestions you can use to host your own Save the Environment Party, to get you and your community psyched and ready to take action to (literally) save the world. What’s a Save the Environment Party? Saving the Environment means a lot of things: addressing global warming, light and sound pollution, ocean and air pollution, endangered species, protected lands, sustainability, and so much more. Whichever aspect of saving the environment you choose to focus on, this kit will give you the tools you need to host a party with lasting impact. Write Postcards or Call either your local or federal officials about environmental issues that matter to you. You can use our Postcard and Calling party Tool Kits as a guide. Citizens Climate Lobby helps you find the names and numbers of your local elected officials and provides scripts to guide you in making calls or writing cards. Do a Craft – Kids care an awful lot about the environment. So if you’re including them in your event, consider making crafts using upcycled materials. You can find some great ideas here, from our friends at AlphaMom. Wondering what you can do to help end the partial government shutdown? You can make yourself heard in a big way by sending postcards to your representatives telling them to refund the government and END THE SHUTDOWN. This Activation Kit contains everything you need to host a Pot Luck and Postcards Party, making it easy for you, your friends and neighbors to write to your lawmakers, give them a piece of your mind, and be heard. Right now, we’re focused on how we can help END THE SHUTDOWN, but you can host a postcard writing party to contact your representative about any cause that matters to you. 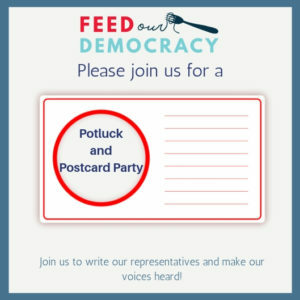 What’s a Potluck & Postcard Writing Party? 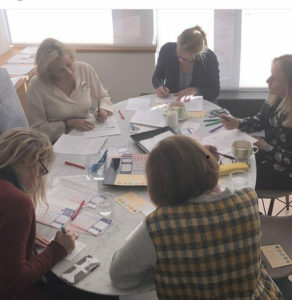 The name of this party says it all: gather people together to write postcards to their lawmakers about a cause or upcoming vote that’s important to them. In this case, you’re telling your representatives that you’re tired of this shutdown and want them to end it now. Your representatives represents YOU, and sending them postcards is a great way to make sure they know what you think. Postcards have been shown to be more effective than emails or even phone calls to let representatives know their constituents are paying attention. Why the Potluck? Well, it’s supposed to be easy! And what’s easier than having friends bring food and drink to share?